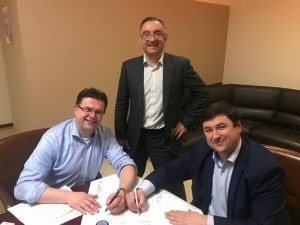 The Feednova company and the Dutch company Mavitec signed a contract for equipment supply for the first stage of plant construction. Mawitek CEO Mako Van Hoimen assured that the Ukrainian plant will have not only high-quality equipment to ensure the main technological process at the plant, but will also become the most modern in Europe. Construction of the Feednova plant will take place alternately. Among the planned 5 production lines, the first will be two independent lines for the production of meat and bone meal with a strict sorting of raw materials according to origin, type and quality. Equipment to the plant will begin to deliver in the second half of this year. The following lines should also be installed in accordance with the project of work at the enterprise. The production capacity of the first line will be more than 12,000 tons of finished products per year. In general, the capacity of the plant will be more than 20,000 tons of products, which will also provide a stable partner for all suppliers of raw materials located in Western and partly Central Ukraine. “Signing a contract gives us a guarantee of cooperation with a reliable international partner. The quality of Mavitec products is confirmed by many years of market leadership. It is important for us to get high-quality equipment and adjust its work in a timely manner. The need for the existence of an enterprise for the production of protein feeds in Ukraine is very large, so we aim to start production quickly and efficiently. Choosing leading companies as partners, we strive to develop the industry in our country and stimulate the export potential of the region. 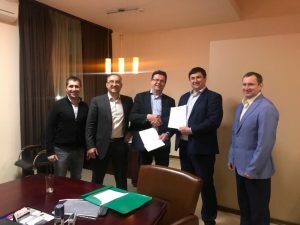 The next step of our work will be the actual construction of the plant and the development of the client base,” – said Andriy Ogorodnik, General Director of Feednova. Innovative technology industry and strict adherence to norms and standards will allow the company to become a leader in the production of feed additives for farm animals and pets. Feednova is a manufacturer of feed protein additives for farm animals and pets. Feednova provides services for the collection, transportation, preparation and processing of material of animal by-products that can no longer be used as human food. The economic development of the region of our presence, as well as compliance with the rules of environmental protection is ensured by high standards of activity of the Feednova company.